First an update : Central govt employees and pensioners would be entitled to 22% DA w.e.f 01 Jan 2009 - A hike of 6%. Those who may have perused the previous post would now know that some MHs are refusing treatment to non-pensioner veterans even though they are entitled to it in accordance with Govt of India orders. Till the time that issue is sorted out, non-pensioner veterans would be glad to know that they are entitled to treatment of serious diseases in civil hospitals too out of Ministry of Defence funds through the Kendriya Sainik Board (KSB). In fact vide Govt of India Letter 08 November 2004, financial assistance for diseases through the KSB is now only available to non-pensioners and not to pensioners who are entitled to ECHS. Under this scheme, veterans are entitled to reimbursement of their expenses for serious diseases such as Heart, Renal, Arterial diseases, strokes and cancers. Officers are entitled to a refund of 60% of treatment subject to certain guidelines while PBOR are entitled to a refund of 80%. Please make this very important aspect known to people around you. In an emergency, strict adherence of guidelines is dispensed with. Policy letters on the subject can be viewed and downloaded by clicking here. Do we have to hide when there’s nothing wrong ? Of course not. And that’s why I say, the RTI Act should be implemented in spirit and not just in letter. It has changed the way we look towards the govt and how the govt looks at its citizens. The services as a whole have implemented and adopted the Act in a genuine and welcoming manner, despite the fact that due to some strange logic, the CPOs have been kept outside the purview of the Act by virtue of Section 24 but the defence services are very much amenable to it. So there you have it, RTI does not apply to the BSF or Assam Rifles but it applies to the Army. But that is not the point I want to make here. Most of the times, our RTI machinery, especially after the job was entrusted to the Education Branch, is judicious and very much careful in the application of the RTI Act. But sometimes we goof up and we goof up bad, and in the bargain the entire organisation suffers a bad name when the discredit should entirely go to those particular officers who handled that particular case. The problem remains in the holy cowish attitude ensconced in some of us. Some of us try to make sure how to look for ways to somehow put impediments in public life and derive sadistic pleasure out of it rather than create a conducive environment for outflow of information and transparency. This attitude ultimately invites bad press and brickbats instead of the bouquets that the forces truly deserve. This is the era of information and not of confidentiality, period. The other day, I was asked by an officer if we could disseminate copies of the Regulations of the Army (DSR) to RTI applicants and whether it was not a confidential document. Some applicant had desired a copy of the para dealing with retirement ages of officers. Damn I thought to myself. The entire DSR has been uploaded on the net on the official army website, it’s a public document to the hilt determining service conditions of our personnel then what the hell was confidential about it ?. Record Offices have been refusing medical board documents based on some dim-witted diktat issued by someone sitting in the office of DGAFMS which says that medical board documents should not be supplied under the RTI Act unless directed by the CIC. Michel de Montaigne had once said ‘he who establishes his argument by noise and command shows that his reason is weak’. Is this a bloody joke ?, the RTI Act is an Act of the Parliament, Medical Board documents are documents concerning one’s own medical condition, how in the world can they be held back ?. And why do you want people to approach the CIC and cause loss to own exchequer and burden on own legal machinery when you damn well know that the CIC has in the past held that such documents have to be supplied ?. In fact I personally once saw a letter received from a Regimental Records Office stating that a clarification had been sought (a year back) from the DGAFMS on the issue and the medical documents would only be disseminated once a reply is received. Fine, so now the M-Block has more authority than an Act of Parliament & the CIC, and that Record Officer would wait for years for a clarification in utter disregard of law rather than implement RTI requests within 30 days as provided under the Act. This veil of secrecy should be shunned. The more we hide, the more people would think there is something shady or devious ultimately bringing disrepute to our great organisation due to our own individual actions and non-application of mind. Only those documents can be held back which are directly hit by the prohibitions mentioned in Section 8 of the RTI Act. Why the above thought came to my mind was this. One mother whose son had died in an operational area (was declared a suicide) had sought documents related to the Court of Inquiry and post-mortem of her son’s death. The reply provided to her was very interesting – that the RTI Act is not applicable to J&K and that not being under the Army Act she was not entitled to any CoI proceedings. Pray tell us, the Act through a decision of the CIC has been made applicable to central govt servants even in missions outside India and here we are talking of our very own India. Perhaps the officer shooting off that reply forgot to browse the Indian Army’s official website which lists out PIOs and RTI Appellate authorities for the Northern Command, all based in J&K. Perhaps his insensitivity of human life took the better of him, otherwise who would refuse a mother the documents of her son’s death or his post-mortem and to analyse this situation in the light of the fact that the deceased was a Shaurya Chakra awardee and that the officer’s father had also died after hearing about his death, makes me want to hang my own head in shame. What a monumental goof up for our organisation by some of our own. If everything is right, then why hide ?. Individual actions like these bring disrepute to the defence services. Visitors on this blog have oft talked of accountability and transparency in bureaucracy, I would say let’s start with ourselves first and reflect it in our own little ways. Things should never come to such a pass. By the way, the CIC has now held that Court of Inquiry proceedings are under the purview of the RTI Act and all central govt organisations in J&K are under the RTI Act. Of course we can always hold back information from a CoI which may be a threat to national security. Cloak of secrecy never works, after all, as Benjamin Franklin said, 'Three may keep a secret only if two of them are dead'. Issuance of SAI for Lt Cols : May take about a week or two. Deliberations are continuing at the govt level regarding the lower stage of the start of scale. Should logically start at Rs 38,530 at least. Pension notification for Lt Cols : Will happen only once the scales of serving Lt Cols are notified. Is bound to take some time because this is to be done by a different department (The Department of Ex-Servicemen Welfare) which is not interlinked with the establishment dealing with serving officers. The status of Time Scale Ranks : Till now, after the implementation of 6th CPC recommendations, Time Scale and Selection Grade Ranks of the Regular Army are at the same footing as far as pay and pension are concerned. Hopefully the same shall continue. Issues regarding status vis-à-vis civilians : Bound to take some time. Will only be determined after recommendations of the proposed High Power Committee. Lt Cols already on deputation : Officers already on deputation may get to enjoy a one-time dispensation on Pay Band-4 as suggested on this blog earlier. Future deputation of Lt Cols to mixed organisations : Status quo likely to continue. Arrears on upgradation to Pay Band-4 : All arrears shall be payable with effect from 01 Jan 2006. I would urge readers to have patience since they have nothing to lose. All affected personnel are bound to receive arrears for the lost time hence a few days here or there should not matter much. Enjoy the brew and Have faith ! Rank badges have no relation with status. Rank badges have been used as a justification by certain services to claim equivalence with the Army, but is this warranted? And do these have any relation with status? 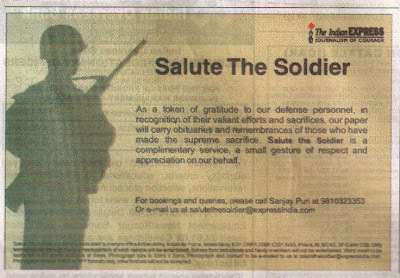 When a soldier leaves for his home station but does not reach his destination, what action is taken by most of us ? When a soldier leaves his leave station but does not reach his unit, what do you do ? When a soldier suddenly disappears and is nowhere to be found, what action does his unit initiate ? Most of the times, the above events result in issuance of apprehension rolls, declaration of desertion followed by notional dismissal from service after waiting for the prescribed number of years. But in such circumstances, declaration of desertion followed by dismissal from service when a person is neither apprehended nor located is not just illegal but also unethical and unwarranted. To substantiate ‘desertion’, a wilful absence of duty and a ‘guilty mind’ is to be established and unless there is any proof to substantiate wilful absence of an individual, such cases should be declared as ‘missing’ or ‘missing presumed dead’ after due diligence and not as ‘deserters’. The stamp of desertion not only results in incorrect forfeiture of service but also denial of family pension to the family of the missing person. Govt of India came out with very clear guidelines on the subject in the year 1988 (which can be downloaded and viewed by clicking here) in which it was provided that if an individual suddenly disappears from the place of duty or cannot be found or located, a police report should be filed and papers for family pension and other retiral benefits for the family should be processed after the lapse of one year from the date of his disappearance. Very fairly, according to the ibid govt policy, the family of the missing person is to provide indemnity bonds to the govt that in case the person reappears, the entire family pension and other retiral benefits shall be reimbursed to the Govt. Hon’ble Courts have also time and again held that the families of missing personnel (even if declared deserters and dismissed from service) are entitled to pension and other benefits in case the person remains untraced. Further the Pension Regulations for the Army provide that the past services of deserters cannot be forfeited for the purposes of pension till the time such deserters are brought before a Court Martial and convicted for the offence of desertion. Hon’ble Courts have rationally also opined that the requirement of filing a Police Report by the family is also not mandatory if an apprehension roll has already been issued by his unit since that amounts to information to the police. Needless to say, if a person remains missing, then even logically we should not declare him a ‘deserter’ unless his whereabouts are confirmed by the police or other evidence. In fact, Para 58 of Section 3 of Army Order 1 of 2003 (AO 1/2003) clearly states that such persons can be declared deserters only after conclusive evidence to the effect is obtained. Hence I would request all serving officers to take care of this very important and rampant issue while dealing with missing personnel in units. It is only when such personnel are declared ‘missing’ (and not ‘deserters’) that the office of PCDA(P) processes claims for pensions. Care should be taken while determining this aspect since it directly affects families who are already facing emotional plight due to the loss of the bread winner and then are deprived of their dues and pension due to this very common oversight on our part. The relevant part of AO 1/2003 and Govt letter on pension for missing personnel must be made known to all especially the clerical staff and there should be a review of all Part II Orders wherein ‘desertion’ has been published but the person concerned has neither been apprehended nor located and the police has also presented an ‘untraceable report’. In the interest of justice, such cases should be converted to ‘missing presumed dead’ even if it involves some extra efforts by way of a fresh CoI. In fact such issues should be handled by officers themselves and not left to the Head Clerk of the military establishment who would just open the Record Office Instructions and go about it in a mechanical manner without applying proper mind. The PCDA(P), Allahabad, has finally taken banks to task in respect of pensions of Pre-06 pensioners. Pensioners have an option of selecting the one of the above which is more beneficial. The first option is represented by Annexure-I of MoD Letter dated 11 Nov 08 while the second one is represented by Annexure-II (Annexure-III for PBOR). Banks were however not understanding some rudimentary stipulations of the MoD letter and were simply using Annexure-I for calculation of pensions. The office of PCDA(P) has now issued detailed instructions to all concerned banks to take remedial measures – the same can be viewed and downloaded by clicking here. The PCDA(P) has also pointed out that such actions of banks are affecting the morale of veterans. Detailed instructions on pension consolidation have also been conveyed to the banks. It has also been communicated that Lt Generals who have retired as Army Commanders / Vice-Chiefs are to be granted a higher pension. This was important since most banks are unaware of the difference in status, pay and pension between Lt Generals and those Lt Generals who have retired as Army Commanders / Vice-Chiefs or equivalent. Confusion about Groups of PBOR has also been clarified. Officers of the rank of Lt Col have sent many emails stating therein that this particular circular is still showing their pensions in accordance with Pay Band-3. I would urge all such officers to relax since the SAI for serving officers has not yet been issued and retirement benefits would only be notified after the necessary promulgation is undertaken for serving Lt Cols. In any case, officers are bound to receive their arrears w.e.f 01 Jan 2006 hence there is nothing to lose. It is just a wait for a few weeks more and that’s about it. There is no conspiracy theory at play as some would like others to believe. The much in news Border Roads Organisation (BRO / GREF) case : What is it about & what went wrong ? Before I start, I would like to clarify that I have nothing against the GREF or the MES and hold these organisations in high regard. For those who joined in late, certain sections of the media have carried reports that three flag rank military officers associated with the Border Roads Organisation (BRO / GREF) have been ordered to undergo 15 days’ imprisonment for Contempt of Court by a Single Bench of the Hon’ble Guwahati High Court. The same story is being circulated with impunity by some GREF and MES officers. But what has not been unfortunately highlighted is the fact that the said Single Bench order was immediately STAYED thereafter by a Division Bench of the Hon’ble High Court. Two minutes of fame perhaps for some, but unnecessary vilification of senior military brass and that too without verification of facts. Sad. What is the basis of this ? I’ll try to explain in uncomplicated terms. As per Schedule ‘C’ of MoD notification vide SRO 329 dated 23 Sept 1960 as amended by SRO 364 dated 29 Nov 1973, Director General of Border Roads has been equated with a GOC-in-C for disciplinary purposes. Now would this mean that DGBR can claim equivalence with an Army Commander ?? A Senior Personal Assistant and an Asst Administrative Officer (Group-B/Class-II) has been equated with a Lieutenant (Group-A/Class-I) of the Army, would it mean that such officers can start claiming equivalence with a Lieut ?? As per MoD notification vide SRO 212 dated 30 July 1987, all Govt servants with a basic pay of more than Rs 2600 (4th CPC rates) irrespective of pay scale, rank and status have been equated with Group-A / Commissioned Officers, now would this give them an excuse to claim parity with Group-A / Class-I gazetted officers ?? The answer to all of the above would be in the negative. That is why, immediately after the Hon’ble Court pronounced its verdict on the basis of the statement of the BRDB, a review or Letter Patents Appeal (LPA) should have been filed by the BRO authorities, which unfortunately, perhaps for reasons elucidated in the succeeding paragraphs, did not happen. But the point to be noted here is that a ring-side analysis of the situation would reveal that the decision of the Hon’ble High Court was passed in ‘personam’ and not in ‘rem’. Meaning thereby that only the person who filed the case before the Hon’ble Court could claim relief and such relief of the Hon’ble Court would not be made universally applicable to the organisation. Coming back to the Contempt case which has already been stayed by a Hon’ble Division Bench of the Guwahati High Court. The Hon’ble Court has rightly observed in the Contempt directions that though modalities of such equivalence were not laid down by the Court but the authorities were bound by their statements and that neither a review was preferred nor an appeal was filed against the decision of the Hon’ble High Court (non filing of an appeal or a review is a glaring lacuna on the part of our legal advisors – perhaps because the officer in charge of the legal wing happens to be a GREF officer !). There is hence an immediate need also to file an appeal or a review with an application for condonation of delay in the main case so that the correct facts can be placed on record and the Hon’ble Court can be apprised of the situation in the actual rational perspective. The MoD and other powers that be should also be informed that the BRDB or for that matter the Ministry of Road Transport & Highways (under which GREF functions) may be apprised that they cannot issue any such directions which de facto affect the status, command and control of the military set-up. To put it brusquely, the BRDB has no jurisdiction or brief to meddle in the military hierarchy and any decision taken or submission made in a Court of Law by the Board which directly or indirectly affects military ranks has to be ethically made in consultation with the MoD and the military and not in a one-sided manner. Circumvention of the status of Presidential military ranks by way of a piece of paper issued by an authority not directly dealing with the military should in no way be considered acceptable or appropriate. Things had slipped out of control in this case, but I’m positive that the situation would be reined and damn well not repeated. "You may be disappointed if you fail, but you are doomed if you don’t try – Beverley Sills"
PB-3 to that miniscule minority of Lt Cols on deputation : I think we need to re-think that one ! (a) The rules in this regard are very clear as far as civil officers of the All India Services are concerned. Any officer proceeding on a post with a lower status remains in his / her own Pay Band and only the Grade Pay is reduced. On that analogy, PB-4 cannot and should not be withheld from such officers and the maximum that can be done is that they can be granted a Grade Pay equivalent to the deputation post that they are holding. The rules on the civil side become clear by perusing Para 9 (i) of this letter dated 29 Sept 2008. (b) Of course these officers could not have predicted this future PB-4 stipulation when they were proceeding on deputation to these organisations. Hence as a one time dispensation, the officers currently on deputation should be granted PB-4 and the said stipulation may only be imposed on future deputationists after making them fully aware of the pitfalls. Moreover, the last pay drawn and the pay in parent organisation of deputationists is protected as per pre-existing policy. (c) The modalities should be kept short, simple and uncomplicated. Simply put, it should be placed in black & white that officers who out of their own volition opt to proceed on deputation to lower posts should be granted PB-4 with a lower GP as is done in case of civil officers. Deputation to posts with the Industrial DA (IDA) pattern of payment or with scales different than the Central DA (CDA) pattern are as it is not affected by PB-3/PB-4 stipulation.